It's been a while since I've done one of these, but I've been wanting to cover another of the favorite D&D books of my teenage years: SJR-1 Lost Ships. 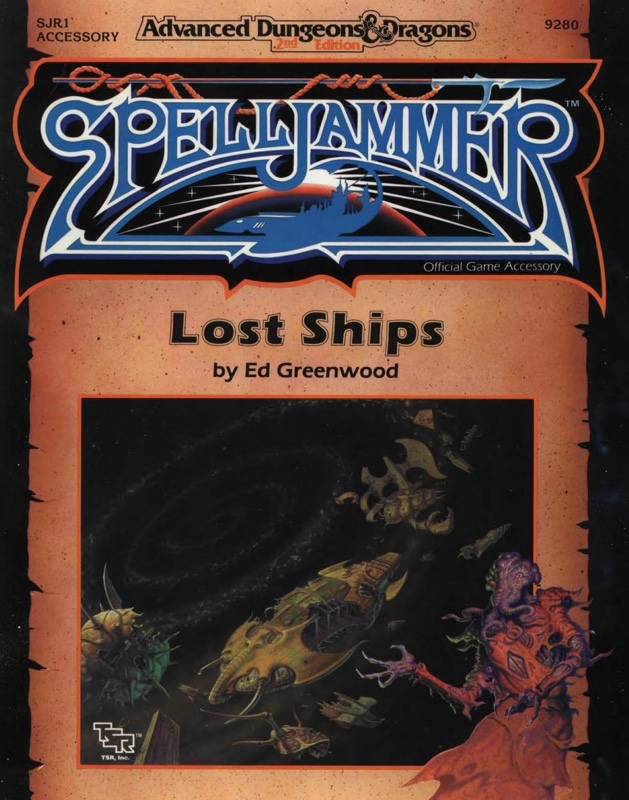 This is a 1990 book for the Spelljammer setting by Ed Greenwood. 98 pages, stapled binding B&W inside. It's written by Ed Greenwood, better known for the Forgotten Realms and Long Stories about Elminster. I actually like Mr. Greenwood, even if his stuff isn't my favorite: He seems like a nice guy and passionate about his creations, just into a different style of gaming than me. As such, it overlaps a bit with other works. I still haven't read The War Captain's Companion but I'm guessing it overlaps a bit with that work, as well as the Spelljammer player's book and the box set (the latter of which it mostly expands). That said, this is a "DM book" for the most part, albeit with some stuff players might need access to (for example, if they end up captaining a Gnomish Deathglory). I intend to go a bit slow when I get to the ships as they're probably the good part, but here's some notes on the first few pages. To Jeff, for opening The Box of Delights again. Interior design resembles the Spelljammer box set. Plain B&W, line art, White-text-on-black sidebars. The "How to Use This Book" introduction is presented in character by, you guessed it, Elminster. Those who can't stand him will likely be annoyed, but he gets roughly a column after taking over from Ed. The introduction is basically an elaborate way to say "There's new rules, adventure ideas, and content. You have to figure out how to use this stuff." It also has a disclaimer that even though Elminster does the talking, this isn't a Forgotten Realms book (Krynn and Oerth get referenced!). The rest of the intro page loses the tone, but is still written very casually. One neat feature that is highlighted is how the adventures will have three entries for XP for Kill, Defeat, and Retreat representing three broad categories. I like it (at least in concept): it means the DM doesn't need to go encounter-by-encounter, but has broad categories. Retreat explicitly requires actually getting in a fight and fleeing, while Kill requires a clean sweep of the encounter, intended to be a challenge in space. Next up is New Rules. This covers a bunch of odd edge cases, so likely forgotten by many DMs. The first section is Drifitng Characters which states that free floating characters have a -2 to attack unless they have the Spacefaring proficiency (keep reading) and provides some ad-hoc rules for grabbing onto stuff (basically, make a Dexterity Check). Opposed grabs are resolved via attack rolls favoring the higher roller. Next is Adapting to Space which could be fun for some groups: Basically, groundlings (characters native to the normal campaign worlds; akin to 'Primes' from Planescape) can be told to roll on the included table when they first drift in space or if they fail a Constitution Check upon leaving atmosphere. The table is a d100 table with no real finesse. basically, 37-100 is "No Ill Effects" (Pun intended) which means 1-2 rounds of -1 initiative due to queasiness, then everything is fine. I wonder at the 'value' of rules like this. It sounds fun (and there's some references in other Spelljammer books to characters getting sick due to the unfamiliar motion) but I feel like it's unlikely to be interesting unless there's encounters right after the PCs leave atmosphere. If they're getting the cinematic "big vista" moment (leave atmosphere, see the world receding behind them, pose dramatically) having Morgar the Fierce trying to keep his 80s hair from getting covered in vomit is not really fun. On the other hand, if they're fighting a pitched 3-way conflict against a group of pirate kender and mind flayers, it might be itneresting to have PCs deal with temporary hindrances. Looking back, I'd favor effects with a save to ignore/remove over this book's blanked debuffs. The Space Catatonia result is written in a very informal manner, basically saying it could be chronic (see feeblemind for ways to fix) or acute (short attacks that become the Nausea effect in time.). It's very loose. There's only 4, and they're all considered 'General' so equally available to all classes. Spacefighting is referred to as 'Spacefaring' in the "Drifting..." section earlier on the same page and negates penalties for drifting, but also a whole lot more. Freely drifting characters with this proficiency get a 1 point AC bonus. It's kind of a mess to take: Spaceborn characters must take it at character creation, and it should be given out to monsters based on DM whim. Groundlings can apparently learn it in space, though. So, yes, it's a change that basically 'forces' spaceborn characters to spend 2 slots (It's a 2 slot Int +1 skill) on this. It's somewhat similar to a 3e feat in that it grants a lot of 'exceptions' and there's no formal reason to check against it. I don't see any reason to boost this skill. Next is Boarding Pike which covers the use of the pike as detailed in the box set. It's a single slot Dex +2 skill and I'm not sure if the intent is just use as a weapon, or a vaguely suggested use as a tool for boarding and such. The 'tool usage' and limitation to those born in or experienced in space travel suggests it's tool use related. The Grappling Hook is similar. It is open to groundlings who were marines at DM's option. Finally, the Wheel Lock Pistol is obviously a weapon (and iconic for the setting). As with the others, it's limited for groundlings. The proficiency (1 slot, Dex +2) does include repair and even improvising parts. More importantly, it makes the weapons less dangerous as it reduces the backfire damage from 1d6 to 1d3. I know the AD&D 'standard' is generally to make a strict rule and leave it up to DMs to bend it, but all of these have wording to forbid them being possessed by groundlings (although the Forgotten Realms was getting guns around this time, so...). I kind of feel like the rules writing is a bit rough. We get about a page of detailed rope rules covering several common situations. There's rules here for Striking Lines (I.E. flying into a line as part of a boarding attempt). If you're doing so, you can try Grabbing Lines or, for the swashbucklers, Swinging on Lines. There's also the slightly different Swinging Out On A Line as well as Throwing Lines and Fired Lines (attacking ropes to a ballista bolt, possibly an improvised one, and firing it near but not directly at a target as a rescue line). Then there's notes on Armor Class While On Lines (It's a -1 against missile attacks) and of course Cutting Lines and Tying Knots. Again, more 'spot rules' for a lot of classic 'ship to ship combat' stuff. There's a small section on Ship-to-Ship Leaps (basically they're risky because the gravity planes shifting causes disorientation). A larger section on Shipboard Gear has some loose rules for handling small items bouncing around a ship that is maneuvering fast or getting tossed around due to combat or other reasons. This final section has a single spot-rule for Crash-Dives including the use of a Spelljammer for suicide attacks on ground targets. It's lacking in details: No damage dice! Importantly, while dropping a Spelljammer on your enemies is allowed, it needs to be done 'unhelmed' as while the helm is active reentry heat is not a thing. The idea seems to be that to drop a ship on a target you need to do so from a distance and the ship might be shot down or diverted. The text suggests that this avoids adding fire to the crash attempt. I feel like if a ship (even the 'small' wooden ships of the setting) crashlands from orbit it's going to do a lot of damage: Fire added to it is minor compared to the concussion damage. That's it for the new rules. In general, these feel like cut material from the box set, perhaps material that should have received another draft. The inclusion of spot rules for things fitting the setting tropes is nice, but the material feels a bit disoriented due to referring to the box set and similar. Next time: Adventures. There's a bunch, and they're split into chapters based on where they'd fall in a campaign. So we start with three rough adventures to get PCs into space, then some spacefaring adventures. There's a chapter of unusual space dock opportunities and some notes on Weird Stuff found in Fantasy Space. What elements are you using if you don't mind sharing? Right now I feel like the Rules section may have been the worst of the book: From my brief skim the adventures are at least good ideas for a DM to build a campaign around and the new ships aren't the common ones you'd see in every port (but the box covered those) but more exotics that should draw attention. On to the next section, which covers adventures. Adventures 1: Beginnings is full of ways to start a Spelljammer campaign or transition to Spelljamming from an established campaign. Total Party Levels: Rough balancing tool. The intro suggests 48, or 8 characters of 6th level average. Total g.p. X.P. : (That looks like punctuation abuse): a measly 14 for the intro... But CP from GP wasn't really a 2e thing by default, was it? Monster X.P. : As discussed earlier, it's broken into amounts for Kill vs. Defeat vs. Retreat. For the sample, that's 7,030 vs. 5,273 vs. 1,758. Setup: A brief note on how to work the adventure in to an existing campaign. The first is basically "You exit a dungeon into the wilderness and find an old wrecked ship." The Adventure: Longer notes in standard-ish D&D styel, with read-aloud blocks in rectangles and such. Of note, I don't think any directly have maps, but may reference the later ship plans. The adventure text uses 'Archlich' while the MCA style pages (not intended as removable) use the phrase "Lich, Arch" which is, I admit, a trivial point of difference. It's a 2 page entry and even gets a second photo (below) for padding. Anyway, what is an Archlich? It's a good-leaning undead and mostly similar to a regular evil Lich. (There's a couple "good" Lich-variants in D&D... Any Neutral liches?) It gets a lot of the basic 'undead' package of immunities and benefits and is noted to "radiate a menacing chill" which is one reason they can be mistaken for a regular Lich. They radiate an 'aura of power' which causes lower-level things to run away. It's not stated if they can turn this off or not. Their touch damages and paralyzes the living but can repel undead. They can animate dead with a touch (skeletons and zombies only) or use their touch to control undead, not repel them. Bring magic to figh them as they have the common immunity to weapons less than +1. They retain spellcasting (An Archlich was a wizard or priest of 18th level or a bard of 24th level minimum before transforming themselves) and get to pick nine spells that regenerate every 144 turns. 144 turns is, i think, 24 hours... Which would have been a lot less ugly way of expressing this. D&D making me do math again. Archliches don't have the normal phylactery of a Lich, but instead imbues their spirit into a magical item which is pretty much the same thing but with some bonus effects. The 9 special spells that return every 144 turns (Can we refer to them as the Gross Spells?) are linked to this item, which is often a mini spellbook. The restored Archlich regains it's 9 spells one per day (but they then restore normally once regained). The usual curlicues and codicils which come with 'complex for the sake of complexity' design. I think it's more complex than the normal lich. I think the intent is the not-phylactery is also a normal-ish magic item, but it's not really explored. The Archlich is described as seeking the undead state for high-minded reasons. it's to protect a place or person and they're very concerned with that task. They can and do work behind the scenes whenever possible and are usually solitary. They're undead forever, but they can and do associate with the living including positive relationships like mentoring or love. They also have a 25% chance of magic robes. Overall, I like the Archlich concept, but it's a bit overly complex for no good reason. It is, however, basically a good lich with some kind of arbitrary differences. The archlich encounter is definitely set up so PCs will at least think it's going to be a nasty fight. They find a 'skeletal figure' slumped in a chair clutching a black rod with a few coins around it's feet (the 14 gp, presumably). It talks, and in a non-"I am the evil super wizard who will kill you all unless you bow before me!" way. It wants to be friends. This is Sharangar Szeltune, a former 19th level mage. She actually has Monologue Protection written in to her encounter, as there's a triggered shield and globe of invulnerability on her helm when she's attacked. She gets a detailed combat routine and will likely cause the PCs to withdraw or talk. She also has two skeletal bats as minions. She's 19th level and as such has an exhaustive spell list she's willing to use but cannot restore (her spellbook is noted as not appearing int he adventure). She carries a rod of death which lets her animate dead (redundant), disrupt undead, or cause death along with abilities to weaken people and plants. I kind of wonder if Sharangar's stats (or the Archlich entry) was created separately from the encounter here: Her carried rod (which is not identified as her not-phylactery) is redundant with her innate abilities and her description doesn't mention her not-phylactery or her 9 special spells. Anyway, assuming she's talked to she's actually pretty cool and just wants to get her ship, Sharangar's Revenge back in the air so she can do what PCs would do in her place: Gear up, make some plans, and get revenge on the Illithids that killed her friends and crashed her ship. She's actually cool if the PCs just say "Sorry, not interested" and leave, although the DM is encouraged to have her eventually fly away and make occasional cameos, presumably with the better adventurer-companions she eventually meets. She's old: The's from the Blackmoor civilization of Greyhawk, which I believe is several hundred years gone compared to the 'modern day' of D&D canon. She turned herself into an archlich using some partially-completed preparations she had on board when her husband and the rest of the crew was killed. Her knowledge is explicitly way out of date. She's been stuck here waiting for someone to come along for a long time. She's going to be an expensive friend, at least at first. Want anything from her, it'll cost reequipping the ship and getting her spellbooks. She has a berzerk button for Illithid. I feel like there would need to be Words if (for example) the ship pulls in at the Rock of Bral and there's a Nautilus nearby minding it's own business. She knows she's isolated from humanity (by reason of undeath) and I get a sense she might know her sanity's slipped a bit, too. She does keep a few things secret. She explicitly talks up going to space to entice adventurers, but also doesn't mention that any caster can take the helm. I could see a fun campaign based around this outline: Have Sharangar as a sort of 'crazy aunt' whom the PCs need to manage. She's a bit overpowered in some ways, but insists on taking the helm (It's a limited helm, but the PCs will still have a Very Fast Ship for quite a while) and spends most of her free time in magical research or 'hobbies' like fixing up the ship. The latter could include weird souvenirs in the helm room and her quarters or painting "Illithids Must Die" on the hull. Whatever works for her, really. Her advice, while freely given, is highly suspect due to age and not realizing that not everyone is undead and/or capable of casting 9th level spells. And, importantly, she is very friendly to 'her crew' but also extracts a price for everything. Expect to to buy that new ballista for the ship because she says you need it, even if you feel otherwise. I could see this working, though. It's a good start. Gear and ships mostly, some monsters. I plan to use some of the adventure seeds as filler when I'm not coming up with good plit ideas. As far as rules, my players didn't want to use 2e, and I didn't want to learn 4 or 5e well enough to DM, so I just ported the lot to GURPS instead. And until they do, she's limited to her 9 special spells, cos the second the lights up the helm all her prepared spells go ppppthhhpt. And a rainbow mist on the sphere's face, and a grey dawn breaking. This would not be the last appearance of the archlich. I think they showed up in 3e and, if I’m remembering correctly (It was a while ago), as an epic destiny in 4e. Sharanger seems designed to be the NPC helmsman in a intro to Spelljammer campaign. She gives the best SR a minor helm can get and the second best if they later manage to upgrade to a major helm, her "kill all Illithids" motive gives a set of evil targets to raid during space adventures, her hidden spellbook stash sets up a treasure hunt, and being a lich means that she will mostly be hiding out on the ship while the PCs interact with others.